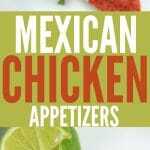 Easy to make appetizers with Mexican flavoured chicken. Serve cold and garnish with cilantro for a great starter for a party or dinner. In a small bowl combine cumin, coriander, salsa, lime juice and cilantro. Add chicken and toss until evenly coated. Cover and refrigerate for minimum 1 hour up to 1 day. When ready to serve spoon chicken mixture on top of tortilla chip and place on platter.